Our triple blend of B vitamins will help the body metabolize foods for energy production. Vitamin B12 also helps in the formation of tissue and red blood cells. Plus, it’s a one a day, chewable tablet which makes it easy way to enjoy your vitamins. 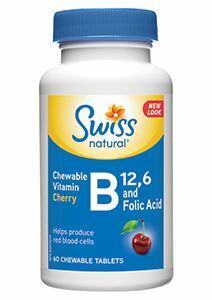 Each tablet contains 1000 mcg of B12 vitamin, 600 mcg of Folic acid, and 25 mg of B6 vitamin. Available as 60 per pack.